Trading recommendations: Remain flat for now. Aggressive traders may remain long, with stop at $17.00 and targeting $18.50 at least. Trading recommendations: Please book profits on all long positions taken earlier and prepare to go short around 1.1070/1.1100 levels, stop at 1.1150, targeting lower. The Fed Reserve, as expected, decided to leave interest rates steady following a two-day policy meeting. However, the central bank sent new signals that it could raise rates in December. In its post-meeting policy statement the Fed pointed out, "Inflation has increased somewhat since earlier this year but is still below the Committee's 2% longer-run objective. The rate-setting committee judges that the case for an increase in the federal funds rate has continued to strengthen but decided, for the time being, to wait for some further evidence of continued progress toward its objectives." Trading Recommendation: The pair is trading below its pivot point. It is likely to trade in a lower range as long as it remains below the pivot point. Short positions are recommended with the first target at 102.45. A break below this target will move the pair further downwards to 102.00. The pivot point stands at 103.50. In case the price moves in the opposite direction and bounces back from the support level, it will move above its pivot point. It is likely to move further to the upside. According to that scenario, long positions are recommended with the first target at 103.90 and the second one at 104.65. We have finally seen the expected break above important resistance at 116.28 calling for more upside towards 118.60 and 122.00 as the next upside targets. Short term, support is now seen at 116.79 and again near 116.28. A break below former important resistance, which now acts as support, will be confusing, but only a break below 115.27 will invalidate the bullish outlook. 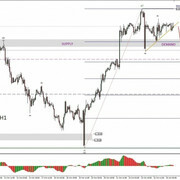 We are long EUR from 115.04 and will move our stop higher to 116.04. If you are not long EUR yet, then buy near 116.78 and use the same stop at 116.04. Trading recommendations: Due to the corrective cycle still unfolding, the daytraders should open only sell orders around the level of 1.3482 as there is uncompleted wave progression to the downside. Sell below 0.7500. Stop loss at 0.7557.